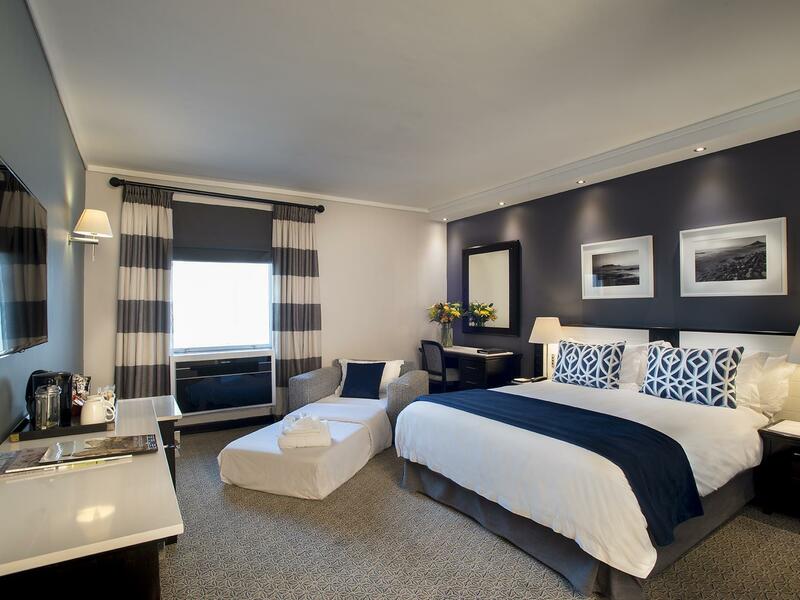 ﻿ The Commodore Hotel Cape Town. JIMAT di Agoda.com! Ada soalan mengenai The Commodore Hotel? Terletak di tengah-tengah V & A Waterfront, The Commodore Hotel merupakan tempat yang sesuai untuk meneroka Cape Town. Terletak 3.0 Km dari keseronokan bandar, hotel 4-bintang ini terletak di lokasi yang sangat baik dan menyediakan akses kepada tarikan terbesar di bandar. Dengan lokasi yang mudah, hotel ini memberikan akses mudah ke tempat yang anda perlu lawati di bandar. Di The Commodore Hotel, segala usaha dilakukan untuk membuatkan tetamu berasa selesa. Oleh yang demikian, hotel ini menyediakan perkhidmatan dan kemudahan yang terbaik. Khidmat bilik 24 jam, Wi-Fi percuma semua bilik, fasiliti tetamu kurang upaya, Wi-Fi di tempat awam, letak kereta berjoki merupakan beberapa kemudahan yang membezakan The Commodore Hotel daripada hotel-hotel lain di bandar. Tetamu boleh memilih dari 236 bilik, semuanya yang akan memberikan suasana ketenangan dan keharmonian. Hotel ini menawarkan pelbagai kemudahan rekreasi yang sangat baik, termasuk pusat kecergasan, sauna, kolam renang terbuka, spa, rumah urut. Nikmati perkhidmatan yang sukar ditandingi dan lokasi benar-benar berprestij di The Commodore Hotel. Kanak-kanak 0-2 tahun boleh menginap percuma. Kanak-kanak berumur 3 - 12 tahun akan dikenakan bayaran 50% daripada orang dewasa untuk makan setiap hari. Ini tidak dikenakan kepada kadar tidak akan dikembalikan. Normal hotel of that class. 10 minute walk to waterfront concrete commercial jungle and hop on bus stop. Micity bus stop outside but never found out where to buy a pass. I got food poisoning from local restaurant and noone from hotel checked on me. The porter kindly went to collect prescription for me. Nice big shower. Fab breakfast. Pool unheated and in the shade in afternoon. Location (bang on the Waterfront)...Hotel rooms (we'd plump for 6th Floor if possible)...superb buffet breakfast and customer service simply couldn't have been better. Look no further. Short and safe walking distance to V&A waterfront with shops and entertainment. Free valet parking. Good standard hotel. Room typical of ‘business hotel’ with fridge and safe. Nothing fancy. Good breakfast with lots of variety. From the moment you enter into the spacious, cool, lobby you are met with 5 star treatment. The staff are unassuming and helpful. I felt as if I was aboard a luxury liner. Worth upgrading to a junior suite if you can as the other rooms are not large. The bar fridge, room service, laundry, I called... they came. Sumptuous bed was indicative of the standard of everything to do with this hotel., comfortable, clean, bright and light.. what was there, worked. What wasn’t simply had to be asked for. The option of swimming and dining at their ‘sister hotel’ adjacent just added to the feeling of ‘holiday resort’ not a 5 minute walk to the ever popular V&A Waterfront with a myriad of bars, extensive shopping experience and restaurants serving everything from fresh caught lobster to Ostrich and even McDonalds. If you have one destination in mind next year and it’s Cape Town, don’t waste your time snd money going anywhere else...this is every inch a 4 star hotel...run by 5 star people. Close to the entrance of V&A. Very nice entrance. Hall. When checking in staff was friendly and quick, not so much when checking out. They did not even look up. Parking was included which was great, we walked from there. Very hot in the room, we could not figure out how to make it cooler. By then we were in nighties and did not want to bother staff, so I opened a window facing courtyard. Had to put up with noisiness then. We did not eat there as there are so many place at the Waterfront. Staff not sure whether they should help us with luggage when checking out. We did not want to leave yet and they kept asking us to bring the car around. Eventually 2 helped to take luggage to car park. Figure out aircon and plugs when you arrive so they can help with that before it’s too late. 5 minutes from the waterfront. staff is quick to react to any complaints. e.g. told them the croissants were not fresh and they immediately changed the whole batch at the buffet table. rooms a bit dated but wasn't planning on spending much time there anyway. Had a fantastic week at this hotel. The staff. , location and facilities cannot be faulted, I look forward to staying here again in the future. This hotel is located Waterfront which is probably the safest town in Cape Town. I booked this accommodation super last minute because I got robbed in Long Street and I got really paranoid so I booked a hotel room. Best decision I've done the whole trip! It is near the Cape Town Port which is such a beautiful place with the perfect view of Table Mountain! Another best thing is it's near awesome restaurants especially Belthazar! Loved it there! Oh it's super near the hop on-hop off main station so you it was super convenient! So yeah I love this hotel! :) I'll definitely stay again if I ever go to Cape Town again. This Hotel really looked after us during our honeymoon. the location is perfect right at the waterfront near amazing restaurants and shopping. Good Gym, one of the best breakfast buffets ive seen. Would stay there again and again. Truly a lovely hotel. Although the hotel is little bit dated, room is clean, spacious and the staff is friendly and helpful. Location is very near the harbour. Breakfast spread was good but remains the same for the 3 days we were there. We would still choose this hotel if we are to visit cape town again. generally a pleasant one. the breakfast was not excellent but good and the service is above board. the rooms are slightly old but clean. would recommend this hotel to anyone who wants to visit the lovely city of Cape Town. Five stars (may be four stars) hotel is in VA water front area. The hotel location is convenient near the harbor, shopping center, restaurants, and red bus city tour. A park is not far too, about 20 min walk. Once reached the park, the other end of the park is the ocean. It is nice to walk along the ocean side walk. The rooms are of five stars standards and modern style relatively large. The Check-in and checkout is easy without any hassle. The breakfast is excellent with variety of choices. Staff is very friendly and speaks good English. Hotel was in a fantastic location, staff were excellent. Reception desk staff not all friendly. Staff in restaurant again some lovely & friendly. Others less so. Room overlooking noisy forecourt wasn’t acceptable. Showed an alternative room which was similar. Not receptive to clients requirements or wishes. The location is superb, right on the Waterfront, with easy access to the sights and amenities of Cape Town. Our car was parked for us, and returned promptly when needed. The staff were friendly, courteous and efficient. The bedrooms are spacious, clean and comfortable. The bar area is delightful, with a nautical theme in wood and brass. The best bit is the dining area and service; we enjoyed a lovely breakfast, with friendly and attentive service from the staff. Thank you very much. We will return! The location of this is a big plus point as it is near the V & A area. It is literally 3 to 5 minutes away. The V & A area is the heartbeat of the city if you only have a few days to spare. We got a room with a view of Table Mountain. That was priceless. The room is fairly large but amenities are sufficient. However the only downside of this hotel are the people. Check in was impersonal and I have always felt that these people are the front line and should always make guests feel welcome. The travel desk and in particular a lady by the name of Lorian was condescending and arrogant. She was not a pleasant person to be dealing with and she made you feel that it was not her job to help or entertain you. The best people in the hotel are those at the restaurant serving breakfast in the morning and also at the Bar. They are the ones that made our day because they are enthusiastic about their work and they are the true ambassadors of the hotel. Nothing is too difficult for them. Well done.